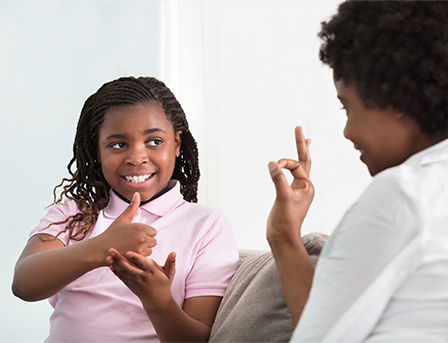 The United Nations has declared that the first International Day of Sign Languages will be held on September 23rd, 2018, as part of the International Week of the Deaf. Founded on September 23rd, 1951, the World Federation of the Deaf is a global movement to raise awareness of the issues Deaf people face in their everyday lives. achieving their rights across all areas of life, including equal opportunity and accessibility. How do babies let you know if they are hungry, wet, or tired? How do you know if your pet has hurt their paw? What do you do to let your family know that you have been hurt? Explain that we all have ways to communicate with others. As people grow, most of us use language to communicate with each other. Ask: How do people who can’t hear communicate with others? Tell students that September 23rd 2018 is a very important day because it is the first International Day of Sign Languages. Ask students if they know what Sign language is. Watch the ASL alphabet/ABC song - Canadian version here, pausing if you wish to highlight some of the letters and let students try to form the letters. Watch this short video and let students practice Signing Happy Canada Day! Can anyone in the classroom speak more than one language? What is it? Please say “hello” in every language you can speak. How do you think people who cannot hear communicate with each other? Why do you think Sign language is important? Share the information in the introduction about the International Day of Sign Languages. Explain that according to the World Federation of the Deaf (WFD), in Canada there are two recognized Sign languages: American Sign Language (ASL) and la Langue des Signes Quebecoise (LSQ). There is also a regional dialect, Maritimes Sign Language (MSL). It is through ASL that the Deaf community communicates and shares experiences, stories, poetry, humour, etc. In addition to Deaf users of ASL, many others may use ASL as a second or additional language. Obtain a chart of the ASL alphabet (many are available online, e.g., here). Project it or distribute copies to students. Ask students to learn how to Sign their names. Share them with the group. Did you find this easy or hard? Please explain. How is learning Sign language like learning any other language? How is it different? Discuss. Why do you think we did this lesson today? Allow students time to rehearse Signing their name and invite them to share what they have learned today with their families. Can you speak more than one language? Which one? Please say something in all of the languages you can speak. Do you think that being able to communicate in more than one language is important? Why? If you were unable to hear, how could you communicate with others? Can you explain what Sign language is? Explain that Sign language is capitalized, because it is recognized as an official language. Obtain a chart of the ASL alphabet (many are available online, e.g., here). Project it or distribute copies to students. Form small groups and ask students to use the chart to create a short sentence (3-5 words) and then Sign it for the rest of the class. What did you learn from today’s experience? How did this activity affect the way you think about people who use Sign language to communicate?